Kevin Sorbo, known across the globe for his portrayal of the title character in the popular “Hercules: The Legendary Journeys” series, will appear as a special guest at Wizard World Chicago Comic Con, August 9-12 at the Donald E. Stephens Convention Center. Sorbo, who has enjoyed continuous success on television for the past 20 years, will meet fans, sign autographs and pose for photos at Wizard World's longest running and highest-attended show. 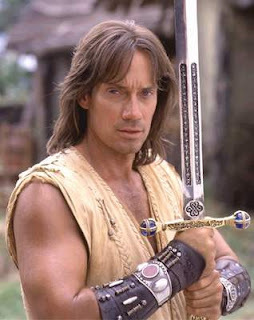 The immense popularity of five initial two-hour “Hercules” telefilms in 1993 resulted in the launch of a weekly series by 1994 and helped launch Sorbo's path to stardom. The series not only became a breakout hit by becoming the number one first-run program in syndication, it also passed “Baywatch” as the most watched TV show in the world. The innovative action hour revitalized the entire action/adventure genre on television and fostered two spin-off series, “Xena, Warrior Princess”, and “Young Hercules”. Sorbo also directed two episodes of the show, and co-wrote one installment. Following the success of “Hercules,” Sorbo went on to star in the lead role of “Captain Dylan Hunt” in “Gene Roddenberry’s, Andromeda.” The series, based upon writings from the late “Star Trek” creator’s archives, debuted as the number one hour show in first run syndication and held that spot throughout it’s five year run from 2000-2005. Sorbo will join other headliners like William Shatner, Stan Lee, Tom Felton, Scott Bakula, Jon Bernthal, Mike “The Situation” Sorrentino and WWE® Superstars CM Punk™ and John Cena®, notable artists Carlos Pacheco, George Pérez, Greg Capullo at the Midwest’s No. 1 Pop Culture Convention. Wizard World Chicago Comic Con (August 9-12), produced by Wizard World, Inc., will bring together thousands of fans of all ages to celebrate the best in pop-fi, pop culture, movies, graphic novels, comics, toys, video gaming, television, sci-fi, gaming, original art, collectibles, contests and more.